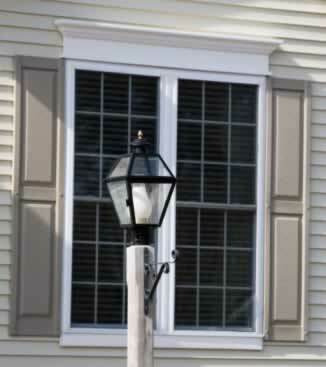 Fixed, double-hung, or casement windows in durable vinyl add charm and value to your home. With vinyl, you'll enjoy an extensive assortment of styles and a color palate that is sure to fit your architectural theme. Optional head molding and paneled shutters create an eye-catching accompaniment to your vinyl windows. Vinyl windows are easy to maintain with mild soap and water, and they hold their integrity year after year against heat, cold, wind, and moisture. For even more value, shop for vinyl double-paned, insulated windows that can make a difference in your heating and cooling costs. E-coatings also prevent damage to your flooring and furnishings caused by unabated ultraviolet radiation. You don't have to break your budget to install historically accurate vinyl windows.